What do private jets, premium jazz, and scorpion toast have in common? 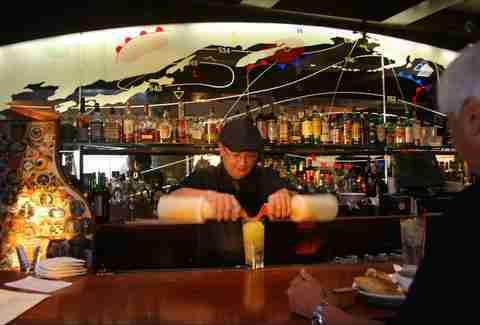 They’re all waiting for you at Typhoon, Santa Monica Airport’s 25-year-old staple restaurant. If you’d like to eat authentic Asian cuisine while watching a plane vanish into the sunset, this is your jam -- at least for a few more weeks. Sadly, the Westside dream dive closes its doors November 8th, so cancel your plans for Saturday and experience this iconic piece of LA history before it blips off the radar. Pilots fly from all over the world just to have one night at Typhoon. Even more impressively, people drive from the Eastside. They come to feel good, “The vibe here is amazing. From the moment you get in the room it changes you,” explains Juan Vasquez, the bartender who, like many of his colleagues, has worked here since the mid-’90s. Walking into the stalwart establishment feels like a step back in time. 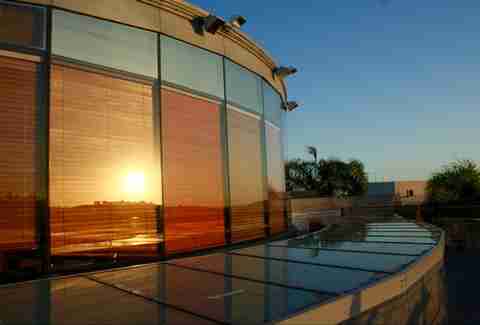 The heavy wooden walls and bar frame floor-to-ceiling glass windows overlooking the picturesque tarmac. An antique glass mirror covered in aeronautical symbols hangs above the full bar. Old pilot’s licenses pepper large, cylindrical beams. It’s a standing anachronism. In a city where people shun gluten eaters, let alone smokers, the elegant ashtrays that the staff provides smokers with (sans dirty looks) say it all. It feels as though they should sell duty-free here -- this isn’t Santa Monica, it’s somewhere between worlds. For those who don’t mind the very occasional whiff of second-hand smoke from a leather-faced pilot with drink in hand, the third-floor veranda allows customers a front row seat to takeoff and landings, “No matter how old you are, when the airplane takes off or lands there’s something magical in there,” says Juan. It doesn’t hurt that there are unparalleled views, either. Where else can you see the ocean, Hollywood sign, and Downtown skyline with equal clarity? The perfect bird’s eye view of the unending sprawl we call LA. The term ‘Pan Asian’ usually means ‘not that great at any one type of food’ -- dishes that may be approachable for everyone but nobody’s favorite. In other words, the California Pizza Kitchen effect. Typhoon, however, is the exception to this rule, successfully capturing the spirit of different cultural delicacies and tying them together with the unmistakable mark of authenticity. Here, everything is made from scratch. Cracking Typhoon’s menu feels like opening a Christmas stocking full of little goodies -- crispy Ahi tacos, Filipino pork sliders, frog’s legs and shrimp galore. The crispy Korean fried cauliflower tossed in gochujang sauce with kimchi ranch tastes miraculously like an improved iteration of the Buffalo chicken wing. 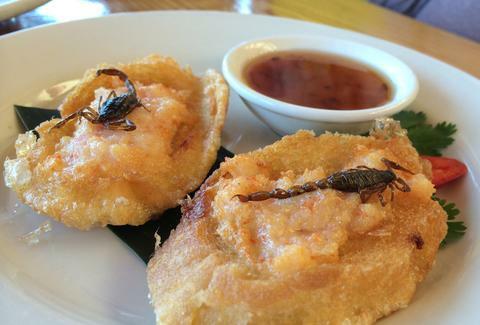 LA’s gustatory daredevils flock to Typhoon for the stir-fried Taiwanese crickets and silkworm pupae. 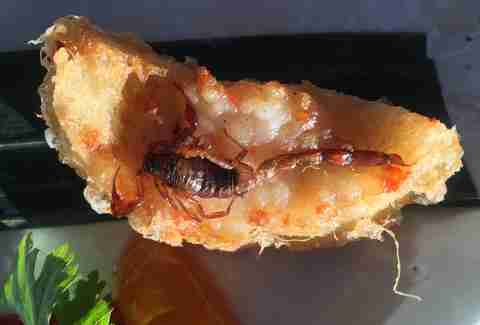 Go try the scorpion toast, (it tastes just like regular shrimp toast but affords bragging rights) and wash the creepy crawlies down with the potent Typhoon Punch -- one sip of this ginormous drink will dizzy you. The menu also accommodates the more timid palate with dishes like pineapple fried rice, pad Thai, and the habit-forming Ma La pork dumplings. The awe-inspiring deep-fried whole catfish with Szechuan sauce positively swims off the menu. Oh, and did we mention they have sushi on Mondays and Wednesdays? For the foodie obsessed with Asian cuisines, Typhoon is Nirvana. Los Angeles native Brian Vidor has a tough guy air about him. Someone who would have done well in the Wild West. A Gene Hackman character. Having owned Typhoon since day one, Brian has become as much a fixture here as the old wooden bar. He patrols the restaurant, keeping things running smoothly and greeting customers with his signature glass of crystal liquid in hand. 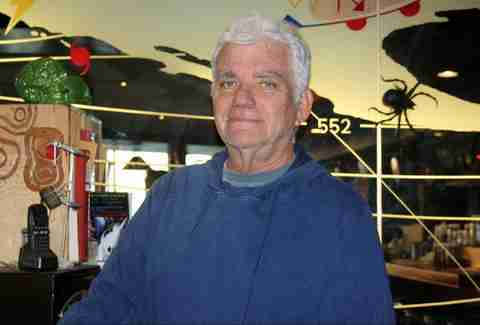 He wanted Typhoon to be his very own Rick's Café Américain from Casablanca; and much like Carlos Haro, Sr. who founded the Casablanca restaurant in nearby Venice, he succeeded. A pilot himself, Brian stumbled upon the venue by accident, “I was sorta changing careers and looking to do a restaurant,” he explains. “I was flying from Carlsbad and there used to be a field pit here and [when I landed] there was no field pit, but the windows were here and there was a sign on the window said ‘Restaurant Space For Lease. '” He couldn’t believe his luck, “I was looking at other places and I couldn’t find anything that I really liked, but the fact that I’m a pilot and landed here... I marched right in there and said, ‘Let’s make a deal!’” Serendipity prevailed and after a year of getting licensed, commissioning local artists for the unique decor, and negotiating with the city (a decades-long battle Santa Monica has finally won), Typhoon opened its doors. Upon opening, Typhoon baffled the locals. “When we first opened, the only restaurant in Culver City was an Ethiopian restaurant and there was nothing on Ocean Park.” People weren’t coming. “So I had to reinvent the whole thing, and we started doing the live entertainment.” Typhoon has since grown into what some call the best jazz venue in LA. 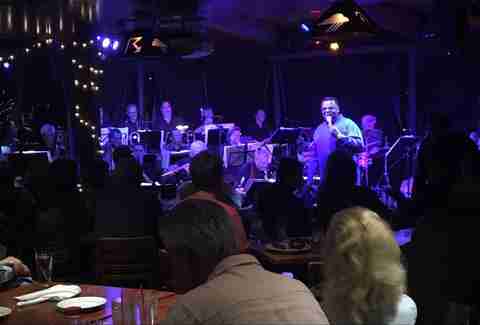 “Where else can you have a 17-piece jazz orchestra?” asks Paul MacDonald of the Paul MacDonald Big Band who’s been performing at Typhoon regularly for five years. “Not many venues cater to that, so when one more goes, it’s tough.” Paul and his band played their last night there on a recent Monday fronted by singer Jay Jackson -- who you probably know as TV anchor Perd Hapley on Parks and Rec, and who happens to be equally as talented on the mic. They closed the night out to standing ovations and shouts of “Noooo!” from the crowd as they said goodnight for the last time. “This has been the best venue that we’ve played in,” says Paul. “People are loyal, they come every time we play. It’s a blow because they have different shows each week. That’s a lot of musicians, a lot of gigs.” The walls display endless framed and signed posters from events here, trophies from some of the best jazz shows in LA history that will no doubt ornament Brian’s new office, wherever it may be. 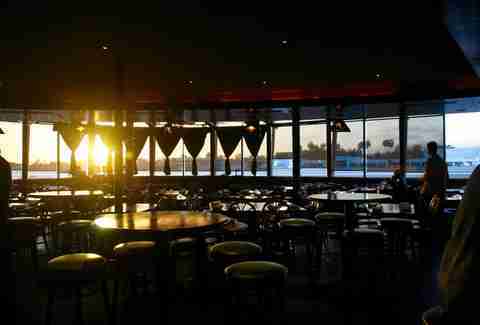 If you go at sunset, Typhoon is as romantic a date spot as anywhere. So much so that many couples who came here on first dates now bring the kiddos and let them watch planes approach through the telescope while they sip cocktails in the sunshine and enjoy the stunning 360-degree views. The vista isn’t all there is to ogle from the large glass windows of Typhoon either. “Generations of presidents have landed right here. George Bush Sr. used to park right next to us.” Even the president of the Navajo Nation came for a visit. It’s a celebrity hotspot -- the roster of plane owners at the Santa Monica Airport reads like the Oscars guest list and many stars will pop in for a drink after flying. The restaurant has maintained a private, speakeasy-like setting where nobody asks for autographs. Harrison Ford, whose infamous crash was a Santa Monica Airport landing gone wrong, is considered just another pilot around here. Still, a nobody can wander in for happy hour at Typhoon wearing shorts and flip-flops and receive the same stellar service as George Clooney in a penguin suit. Each waiter and bartender has a sophisticated sense of service, so much so it appears they went to finishing school. “I just hire nice people,” admits Brian. It hasn’t all been movie stars and sunset Mai Tais though, Typhoon has a dark stain in its history book. The restaurant’s former daughter-like establishment, a sushi joint called The Hump that occupied Typhoon’s uppermost room, was shut down in 2010 for the illegal sale of whale meat after the Oscar-winning documentary The Cove exposed them. Whale meat sells for up to $200 a kilogram and many sushi restaurants serve it off-menu to this day. The Hump is a pilot’s term of endearment for the Eastern end of the Himalayas that they crossed on journeys from India to China, but after the whale meat scandal the name took on a grossly ironic new definition. Typhoon weathered the storm, a huge testament to the place considering how passionately most Angelenos feel about whales. The thing is, Typhoon is pretty much irreplaceable. 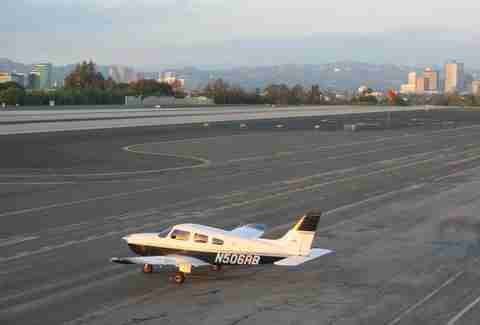 In addition to the jazz and food, the restaurant is considered by many to be the one-and-only hub for pilots in LA. “Where am I going to hang out now? This is my entire social life,” says Dave Harris Ronnenberg, a legendary pilot around these parts. “I walk 100 feet from where I work to here. I came here for lunch with my son today and I’m already back.” Local pilots are to Typhoon as bees are to the hive -- they go fly about but always come right back here. Park yourself on a stool at the bar and you’ll no doubt hear people talking shop and excitedly exchanging notes about the latest stunt they experienced in the Berkut, a two-seater canard plane designed by Dave himself. On Monday nights before jazz, the bar is lined with old guys in brown leather jackets enjoying amber liquid with neither ice nor cocktail umbrella. Sadly for these devoted Typhoonies, the glory days are screeching rapidly to a halt. In the ongoing dispute over the closure of Santa Monica Airport, the city is attempting to slowly kill the airport before the slated execution in 2019. “They raised my rent by 200 percent,” says Brian, “The city wants to close the airport down, that’s been their goal from when we first opened. I always knew this could be a problem.” Dave feels as though he’s being forced out, “The city says the airport isn’t making enough money. Why isn’t the airport making enough money? Because the city has curtailed operations. They have the smoking gun in one hand and the eulogy in the other,” he states with the ferocity of an eagle in danger of losing his wings. Brian theorizes that the airport closure has less to do with preventing pollution as the city has stated, and more to do with the money that stands to be gained from the airport land, which, at Santa Monica prices could be worth the price of a small country. Santa Monica residents are largely united in ousting the airport as they feel it serves the 1% at the expense of the other 99%. Whatever the case, it’s undoubtedly the end of an historic era. The airport which opened circa 1919 and predates all other airports in the county, takes with it a piece of LA history -- a counter-culture, a world that revolved around a restaurant. Typhoon takes with it an era. Presently Typhoon is hosting a month long End of the World Party with events nearly every night including the Mike Price Jazz Orchestra on Monday, October 24th, plenty of jazz, a Grateful Dead cover band, and much more. In an extended pre-death wake, Typhoon is exhaustively enjoying what life it has left. The End of the World Party will cheekily culminate on November 8th -- election night. Guests will mix potent political feelings with grief over the loss of their favorite joint in what will surely be a cyclone of beers and tears. It will be a night to remember -- though most may not. Kelly MacLean is a freelance writer and podcaster who would never in a million years eat Silk Worm Pupae. You can follow her on Twitter and Instagram, just don’t follow her in real life because she’ll definitely get you lost.